I saw your devlog while you were still working on this and I thought it seemed really interesting so I was happy to finally play it! It's well done. The art is cute and the conversations are tough. I played through a few times and got a couple of different endings. I like how you even have some slightly different endings where they decide to try to work it out. Well done! This is really cute! I'm surprised by how much you managed to get done in two weeks. The whole world and the art and the characters were adorable. The combat system was a little clunky. I couldn't figure out how to time my attacks or which part of the attack was actually damage dealing (was it just the end of her arm?). So I died fighting the worm things and it was a little frustrating. But still, really good work! Especially for your first game, and for the time limit! I didn't get that far because I'm not very good at platformers, but this is a really good concept and an interesting execution. Being the person I am, I always chose what I thought was right regardless of how it would effect the difficulty, which is maybe part of why I didn't get that far. It was kind of creepy and thought provoking, which is I think what you were going for. You may not have been able to do everything that you wanted to with it but I think what you did do was really cool. Very cute! I love the animation of the cat curling up when your'e not moving. I'm no good at platformers so I didn't make it very far, but the character sprite is super cute! Overall, I really like the aesthetic. I like the idea of having kickback for the weapon, and needing to use that kickback to solve puzzles. I'm not very good at platformers so I never made it very far past the first level, but it's clever. This is really interesting! The disconnected dreaminess of it (and the different colors) reminds me a bit of the classic text adventure Photopia. The writing is really good. The words are sometimes put together in strange, unexpected ways that enhances the dream-like quality of the piece. There's no real conclusion and no real answers, but it's better that way. There are hints of something deeper (losing your mother tongue, being a new person in a new land, losing connection to your self when you lose connection to your home, etc) that are super interesting and insightful. Overall, really cool! I enjoyed it a lot. This is such a nice idea! It's so simple and therapeutic. Good job. The quotes I have in the first post are all from the original book, ha ha. I haven't done any of the writing for the game yet, but I'm actually pretty good at copying writing styles, and dialogue is one of my strengths! Part of why I wanted to do a fangame was so that I could spend more time on the quality of the writing itself rather than just on coming up with ideas/world building. I spent a lot of the day yesterday and then some time today watching/reading various Unity tutorials. This is my first time using the platform so I have a lot to learn. Orcs of Uberwald will essentially just be a series of menus so I'm focusing on menu tutorials, ha ha. I also spent about six hours today making the map for the game. This map will essentialy be the main screen for the game. Players will travel between the white spaces on the map, occasionally running into encounters (essentially small text-based adventures). I definitely won't be able to finish encounters for every space, but I'm hoping I'll at least get some done for the major locations. This was the only art asset that I was doing myself, so now I've really just gotta concentrate on figuring out the coding. My first thought was "I love the colors!" but I see everyone is already saying that, ha ha. I guess it's a consensus! The colors are good! This sounds like a really fun puzzle mechanic! My First Game Jam: Summer Edition community · Posted in [DevLog] Whimsy Creek - A Farming Sim, with a twist! Wow, this sounds ambitious! I'm a huge fan of farming sims myself, so I'm really looking forward to this one! This sounds like a neat game! I think Twine is a pretty good engine for creating a dream-like atmosphere for a text game. I like the idea of creating a soundscape, too. Good luck! I can't wait to play your game. Hi everyone, I'm Brenna. I participated in the first game jam and made a game called Void Talk. This is such a great event with such a great community and I'm so happy to be back! I just finished another major project (I wrote a novella in a couple weeks, ha ha) so I'm not sure how much time or energy I'll have to devote to the jam this time around, but I'm hoping to at least complete a playable demo by the end of the two weeks! This is a fangame based on the book Unseen Academicals by Terry Pratchett, so I definitely won't be selling the game, but I'm hoping to make it fun and accessible to people who have never read the book, too! 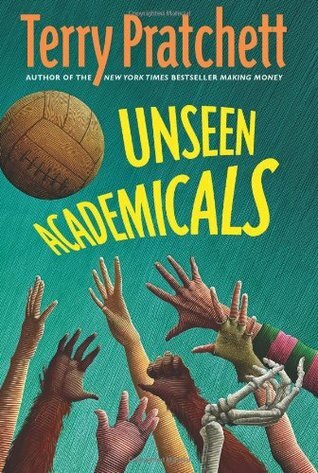 Orcs of Uberwald takes up where the book Unseen Academicals leaves off. Pie-chef Glenda Sugarbean and her soft-spoken orc boyfriend, Mr. Nutt, are on their way to Uberwald to find Nutt's scattered people (once thought extinct) and help them to become a part of the wider Discworld community. Of course, Glenda and Nutt will also face the challenge of getting humans (and the other various humanoid species of the Disc) to accept the Orcs, who are widely viewed as mindlessly violent, evil creatures. It's a game of travel, adventure, and diplomacy! "I would like you to teach [the orcs] civilized behavior," said Ladyship coldly. 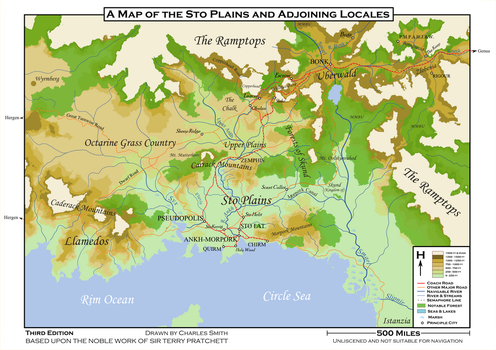 I want to do a sort of combination of a map exploration / text adventure game. My basic concept is this: You travel around spaces on a map occasionally running into encounters. When an encounter is triggered, a text box pops up that explains what happens during the event, giving the player choices of what to do in response. Usually the player will gain something or be hurt by the results of their choice. The player will also gather resources that will aid in traveling and in completing tasks. Glenda Sugarbean: Fat, motherly, and always the responsible one, Glenda ran the Night Kitchen at the Unseen University. 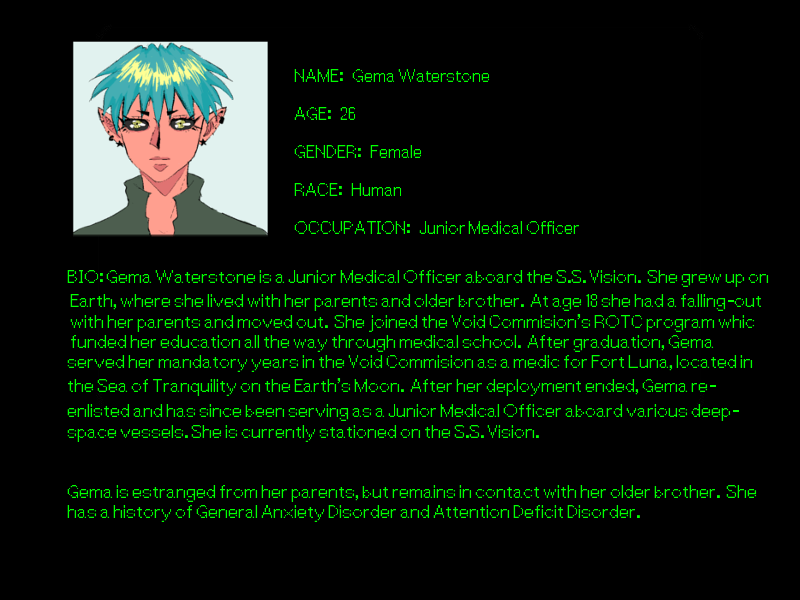 Glenda is strong willed, determined, and can't stand to see people taken advantage of, whether they're poor football players or a nice orc boy with a tragic backstory. She's always ready use her street smarts or her cooking skills to get her where she needs to go, and she's not afraid to chew out authority figures if they deserve it. She has a 3-eyed teddy bear and, despite her overwhelming practicality, loves soppy romance novels. Nutt: Nutt is an orc, a species that is widely feared and despised in the Discworld. At an early age, he was chained to an anvil by fearful villagers. Eventually rescued by a clergymen named Reverend Oats and given an education by the vampire Lady Margolotta, Nutt devoted his life to becoming "worthy" of life and affection. Uncertain and afraid of his own origins, Nutt eventually learns to accept himself for who he is. Nutt is soft-spoken, intelligent, and very strong. "But here I am. You asked why I am strong? When I lived in the dark of the forge, I used to lift weights. The tongs at first, and then the little hammer and then the biggest hammer, and then one day I could lift the anvil. That was a good day. It was a little freedom." "Why was it so important to lift the anvil?" 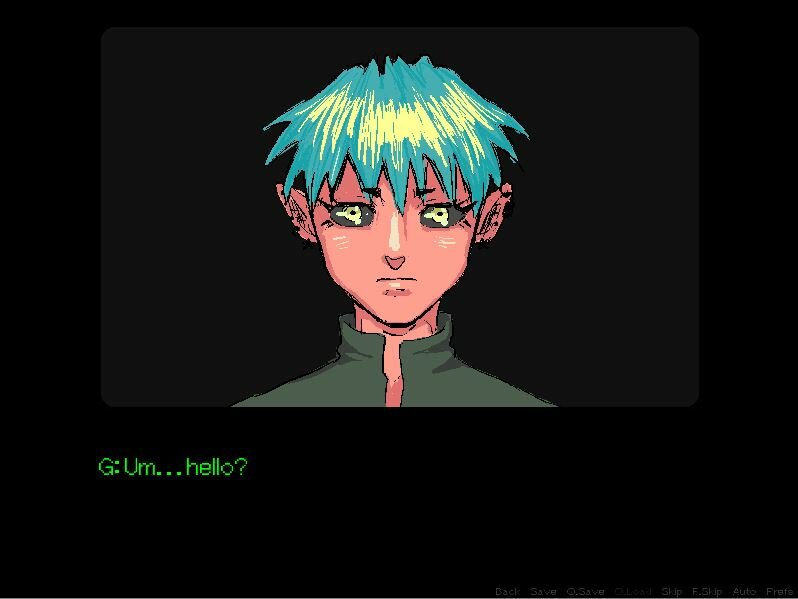 I think this game would be pretty easy to make with any number of visual novel engines, but I'd really like to start learning some real programming that I can use for multiple projects, so I'm going to be building this game in Unity. I'm a total beginner here, so it'll be exciting to see how this goes. 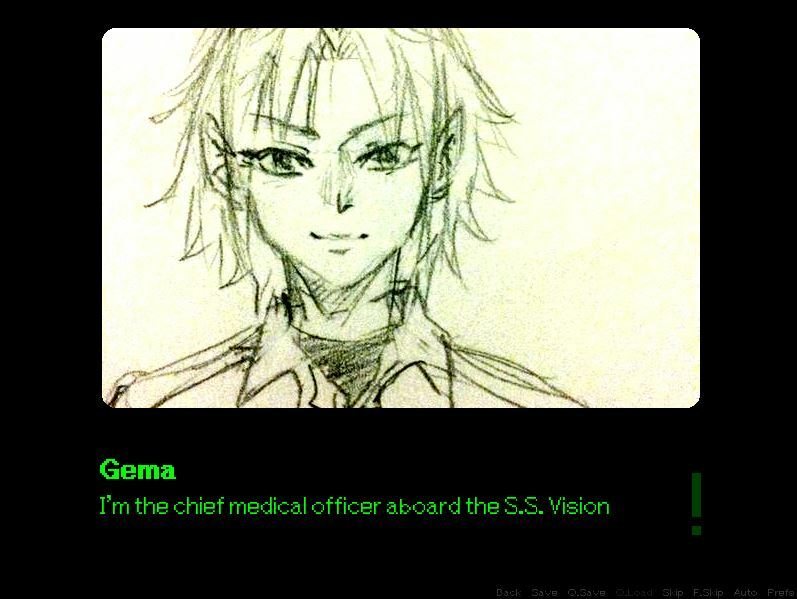 Once again, my sister Rose will be joining me to do the art for the game. I'll start posting some concept art as she makes it. Edit 7/10: Added the finished map near the top of the post. Your art continues to be SUPER CUTE! I'm really excited for your game! Hi there, I'm Brenna! I'm currently working for a small board game developer, but I'm interested in video game development, too! I'm primarily a fiction writer, but I'd like to learn more programming. I did! 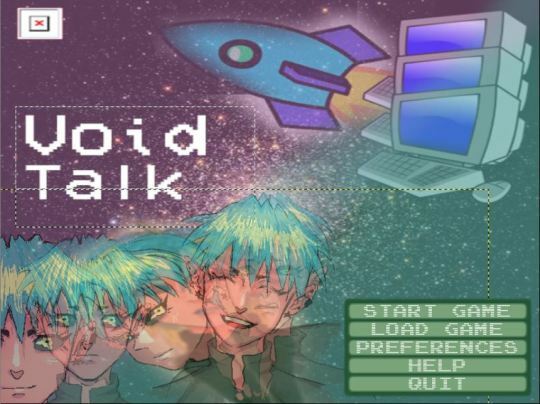 For the last jam I made a small game called Void Talk. At the time, I was working a crappy food service job and I was very depressed. The jam gave me something to work on that I really cared about for a couple weeks, and left me feeling like I'd accomplished something. The community was also very great and supportive and I made several friends over the course of the jam. The jam really helped me through a tough time! I don't have much time or energy this time around, but I really want to dive into learning some real programming and test out a few game-play ideas I had. I don't think I'll have anything very substantial done at the end of two weeks, but I'd like to have something playable, at least! Some of my favorite games are: The original Ace Attorney trilogy, the Professor Layton series, the Harvest Moon series, the first three Monkey Island games, Okami, and Katamari Damacy, among others. I've always loved games that are unique and fun, with good stories and engaging gameplay. You may notice that a few of these are point-and-click adventures. I've always loved that genre, and its waning popularity is part of what first made me interested in making games! I haven't made a point-and-click adventure yet, though. I've used Inklewriter and Renpy before. I wouldn't call myself an expert on renpy, though. I'm passionate about good storytelling! Discworld Open Jam community · Created a new topic Is anyone actively working on games for this? I saw the topic of this game jam and got really excited. I've got a fun idea for a game following Nutt and Glenda's adventures in Uberwald post-Unseen Academicals, but there are no topics in the forum yet, no screenshots posted, and the one game that's been submitted is entirely unrelated. So if you're actively working on a Discworld game for this jam, reply and let me know. What are you working on? How's progress? Let's start a conversation and create a community. A pretty fun game! Nicely surreal in concept. I couldn't find the 4th ending so I just kept ordering drinks over and over to see if drinking myself to death was a possible ending or something. I ordered over 200 drinks but it didn't do much, ha ha. I got the Almond Death ending, the Washroom is Occupied ending, and the successfully seducing the lady in red ending. I hope all of you who were interested in aren't disappointed! We had to scale it back a bit from what we first had planned but I'm ultimately really proud of what we accomplished. Rose's art is really nice and elevates the whole game along with it. I'm also proud of some of the things I was able to accomplish with the programming. I'll leave you guys with the new, updated cover image and I hope I hear back from some of you after you've played it! We're mostly finished, I really just have to go through and add in all the official sprites now and I'm already halfway through that. Then just some bug fixes and some soundtrack/sound effect things. I really love the angry sprites Rose drew. My First Game Jam community · Posted in Anyone else planning on pulling an all-nighter? At around 5am last night (which is actually half an hour later then I usually wake up for work) I started dozing off WHILE writing code and waking up to find weird stuff in the code, so I went to sleep for about 3 hours. Now I'm back at it! I'm mostly done, I just need to go through and add all the art in, really, and do some testing. I think I should still make the deadline. And Hiroshi, I know how you feel. I also had to scale my game back A LOT to meet the deadline. We've finally done away with the placeholder sketch! I'm still plugging away at the tedious writing/programming. Gif of the burgeoning evidence-presenting system! I'm really proud of it. My First Game Jam community · Replied to Cottontail in Anyone else planning on pulling an all-nighter? Ooh, yeah, you've got to put your health before game dev! You should definitely get some sleep if you're recovering from a cold. And yeah! We can do it! My First Game Jam community · Created a new topic Anyone else planning on pulling an all-nighter? I work full-time so I didn't really have the time or energy to work on my game much during the week. But I've got tomorrow off so I'm planning on just working straight through to the deadline to make the best, most complete game that I can. I've got energy drinks and gummy worms to help keep me awake and happy through the night. Is anyone else going for a big last second crunch? Or are you all better at time management then me? Aaaaah, I love the merserker!!! Both in concept and execution. Look at that little exclamation mark there. Not much different to look at still because I'm still using default art. Still, we're getting there, if slowly. My goal is to have 3 therapy sessions in total to tell something of a complete story. If I have to, though, I'll submit it with only one of the sessions done. I'm definitely going to turn SOMETHING in after all this work. I like this idea! It seems simple and fun.